Interdigital neuroma more commonly known as Morton's neuroma or "foot neuroma" is an entrapment of a nerve that passes into the toes of the foot. The nerve gets entrapped or “pinched” by the metatarsal bones, which are the bones just behind the toes. This condition can be very painful. Typically, a person will be walking in shoes (although the condition can be painful out of shoes as well), and will develop a sharp pain just behind the third and fourth toes. The pain may be so severe that some have described it as a "knife being stabbed into the forefoot". 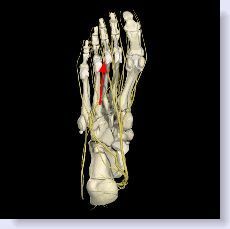 Below is a picture of the primary Morton's neuroma location, represented by the red arrow, (but not the only site as this pain may also appear in between the other metatarsal heads) for neuroma pain. This is the true Morton's neuroma. This pain may then radiate into the toes and manifest itself as overt pain, numbness, tingling or burning. This is the most common location for Morton's neuroma, but this condition can also affect the other toes as well. On occasion this pain may also travel backwards further into the foot. Many people will relate that they can feel a “clicking” in the affected area. This is actually the nerve moving up and down between the pressures of the adjacent metatarsal bones. (As a side note, recreating this "clicking" pain by squeezing the foot side to side is the classic Morton's neuroma test, known as Mulders sign. It is important to note that you can have a neuroma without a positive Mulders sign.) People find that if they remove their shoes and rub the area for a couple of minutes, the pain will subside, only to return once they start walking again. 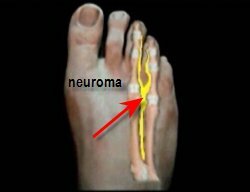 Other conditions that occur in this area of the foot may mimic neuroma pain with no actual neuroma present. A bursitis in between the two metatarsal bones may put pressure on the nerve and create neuroma type pain. Click here for more information on bursitis and its relationship to neuroma. Secondly, a condition called capsulitis may also give similar symptoms as a true interdigital neuroma. Click here for more information on capsulitis and its relationship to neuroma. Additionally, a metatarsal stress fracture may also create similar symptoms. Lastly, metatarsalgia pain can be mistaken for neuroma. Click here for more information on metatarsalgia and its relationship to neuroma. Diagnosis of a neuroma is usually made on clinical grounds. Unlike most soft tissue lesions, for some reason an MRI can be deceiving in making the diagnosis. I can tell you from personal experience that over the years I have had patients who had a negative MRI for neuroma and I went in and removed a neuroma. I think most doctors who treat this condition on a regular basis will tell you the same thing. A diagnostic ultrasound tends to be a bit more reliable but again can be problematic in making a diagnosis. Below is a short (15 second) video demonstrating how the nerve gets irritated and then enlarges from this irritation. There are a number of treatments for Morton's neuroma depending on the severity. Sometimes, just identifying a certain pair of shoes that sets off the pain and no longer wearing them will eradicate the problem. Anti-inflammatory medication can be helpful, but this should be considered temporary relief and should not be considered for long-term treatment, as there are potential systemic problems with taking this type of medication for long periods of time. Orthotics- a foot specialist (podiatrist) may recommend an orthotic device, which is a sophisticated arch support, custom made to the structure of the patient’s foot. The purpose of which is to control the abnormal structural components of the foot, which are contributing to the condition. Many times a Morton's neuroma pad can be built into the orthotic which then attempts to spread apart the adjacent metatarsal bones and thereby remove the pressure on the nerve, thus reducing pain. I generally reserve this type of neuroma treatment for patients who are not candidates for other types of treatment. This type of therapy is the most conservative type available for this condition. For more information on orthotics and Morton's neuroma, click here. Cortisone injection of the area can also be very helpful. Some doctors will inject cortisone in an effort to reduce the inflammation of Morton's neuroma. Denatured alcohol injections- 4% denatured alcohol injections given in a series, attempts to sclerose, or deaden the nerve. My preferred treatment is multiple injections of denatured alcohol. Anywhere from one to seven injections repeated on a weekly basis are necessary. I have found the success rate to be in the 80-85 percent range. Cryosurgery- another nonsurgical option that has become available in recent years is the use of cryosurgery. As it relates to neuroma, the growth is "frozen" via the insertion of a probe into the area of the neuroma. This freezing of the neuroma deadens the nerve thus eliminating the pain. The procedure is an office procedure performed under local anesthesia. I think it is important to point out that this procedure is best performed under ultrasound guidance. Most foot specialists are very familiar with Morton's neuroma and think they can isolate the nerve just because "they know where it is". This is not necessarily true. Injecting blindly increases the chances of complications including missing the nerve entirely, freezing by mistake, an artery or a vein or perhaps even the interossei muscle that runs between the metatarsal bones all of which can lead to more pain and problems. By using ultrasound guidance, two very important issues are addressed. One is that there is truly a neuroma and two, the nerve is actually frozen and not another structure in the area. There may be some mild post procedure discomfort that should be relieved with a mild analgesic. Below is a video of the procedure. MIND procedure- within the last few years a new procedure called "minimally invasive nerve decompression" or MIND has been developed. This type of surgery is a minimally invasive procedure where a very small incision is made, special surgical instruments designed solely for this procedure are then introduced into the surgical site and instead of excising the neuroma, the pressure exerted on the neuroma mass is relieved (decompressed) by simply cutting the transverse metatarsal ligament. The idea here is that even though the nerve is enlarged, if there is no pressure on it from other surrounding structures, in this case the transverse metatarsal ligament(the ligament that attaches to the adjacent metatarsal bones and helps hold them taught) and adjacent metatarsal bones, then there should be no pain. by cutting this ligament the two adjacent metatarsal bones which usually aggravate the formation of neuroma are separated slightly thus relieving the ongoing pressure on the nerve. It is my understanding that preliminary studies have demonstrated a success rate at least equal to surgical excision with the obvious benefits of less pain post-operatively and quicker return to normal shoes and activity. Surgery- when all else fails, surgical excision is usually recommended. This is an out patient procedure where the entrapped nerve is removed. As with any surgery there are potential complications and your doctor should explain these to you. The two biggest complications are misdiagnosis of the Morton's neuroma; the nerve is removed and the patient still has pain, or the surgeon removes what he perceives to be the nerve but by mistake removes a vein or tendon. The second, more common complication is not resecting enough of the nerve and being left with what we call a stump neuroma. The patient will continue having pain while eradication of this new problem becomes much more difficult. As a side note to surgical excision of neuromas, podiatry has always been a leader and innovator of minimal incision surgery, the art of surgical correction of a problem using a minimum amount of dissection and thus trauma to the surgical site. This type of surgery obviously leads to a less painful post operative experience and quicker overall healing time. Excision of the neuroma is usually made through the top of the foot, even though the neuroma occurs on the bottom of the foot. This is done to avoid scarring on the bottom of the foot which can end up being very painful. The procedure itself may be done on an out patient basis. The patient is able to ambulate immediately afterwards with nothing more than a surgical shoe.